Cast iron cookware is a work horse in the Wood Stone oven for everything from searing to deep-frying. Lodge has a signature line of seasoned cast iron tableware we like and the oval mini-server makes for a fun baked egg presentation at the table. Handmade La Chamba black clay cookware from Colombia is rustic and elegant at the same time. The 6 inch Mini Cazuela is perfect for these recipes. 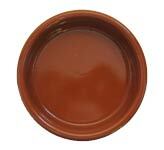 And don’t forget Wood Stone’s favorite Spanish glazed terra cotta cazuelas!